This is a simple and sweet omelette that's perfect for a relaxing breakfast. The combination of eggs and dates is so filling that I'd rather make it later in the day for brunch or for a light lunch. Sometimes there's nothing better than a super simple, quick and tasty omelette when hungry or when you just don't want to cook an elaborate dish with too many ingredients. I find the sizzling sound of the egg mixture gently pouring into the hot frying pan on a Sunday morning to be quite soothing. I cook eggs in moderation but it still remains a favorite ever since my childhood, when serving omelette on Fridays was a ritual in our home. 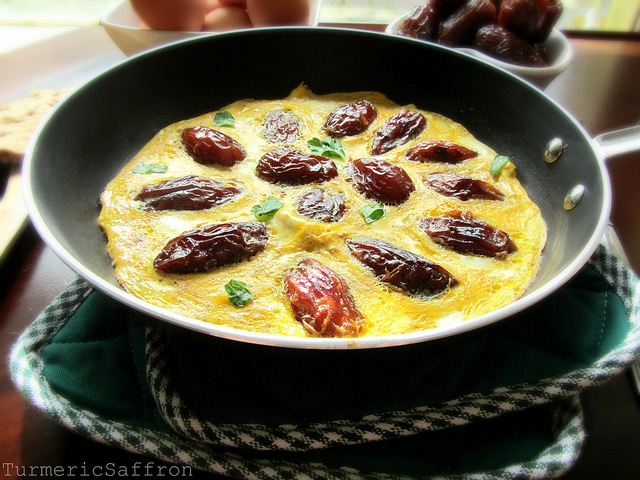 املت خرما و عسل Date and honey omelette can be served to friends and family for a great brunch or when alone at home and you want to make something delicious but fast that can be both lunch and dessert combined! Nothing beats an easy and delicious omelette! 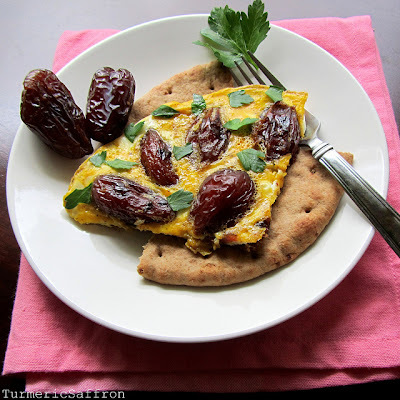 Any kind of dates will do for this recipe -- I used Medjool dates this time. However, I would like to point out that the best dates, in terms of the texture and taste, are the silky dark-colored dates from the city of Bam in Iran but unfortunately it's often hard to find them in Persian grocery stores around where I live. Heat butter in a non-stick frying pan over medium heat. Swirl the pan to coat the bottom evenly. Add the dates and cook lightly until they soften for a couple of minutes. 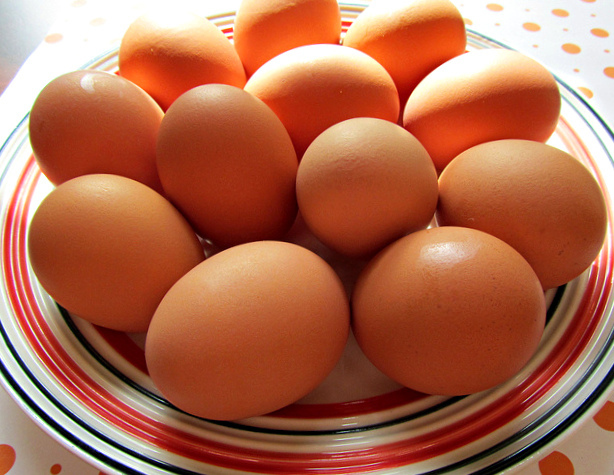 In a bowl lightly beat the eggs with a fork until the yolks and whites are well blended. Add water and season with salt and pepper. Mix well and add to the frying pan. Stir the eggs using a wooden spoon or a rubber spatula and arrange the dates evenly in the pan. Cook the eggs until the whites are set. 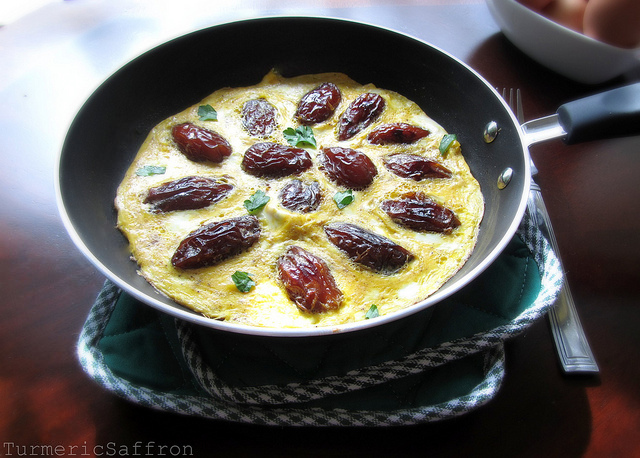 Using a spatula, loosen the edges and transfer the omelette onto a serving platter. Serve immediately. Serve warm with flat bread and add a drizzle of honey on top. 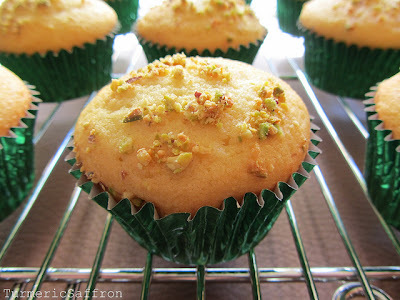 This is a no frosting, mildly sweet cupcake with rosewater aroma, cardamom flavor and chopped pistachios sprinkled on top. کیک یزدی Cake Yazdi takes its name after the city of Yazd, the capital of Yazd province in central Iran. 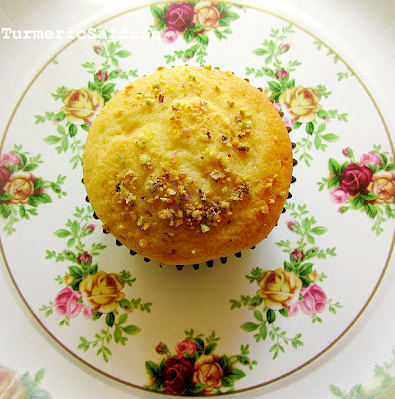 This delicious cupcake is truly a delightful dessert that can be enjoyed during any time of the day. These cupcakes can be packed for your kid's lunch, family picnics or taken on a road trip or on a plane. That's how I remember having my last Yazdi cake from back home -- on the plane en route to New York many years ago. The memory is still fresh in my mind. One of our relatives handed me a brown bag filled with freshly baked yazdi cakes amidst the tears and goodbyes as I was about to board the plane early morning at Tehran's Mehrabad Airport. Sometimes, a kind gesture leaves you with an everlasting sweet memory. This recipe is adapted from M.R. 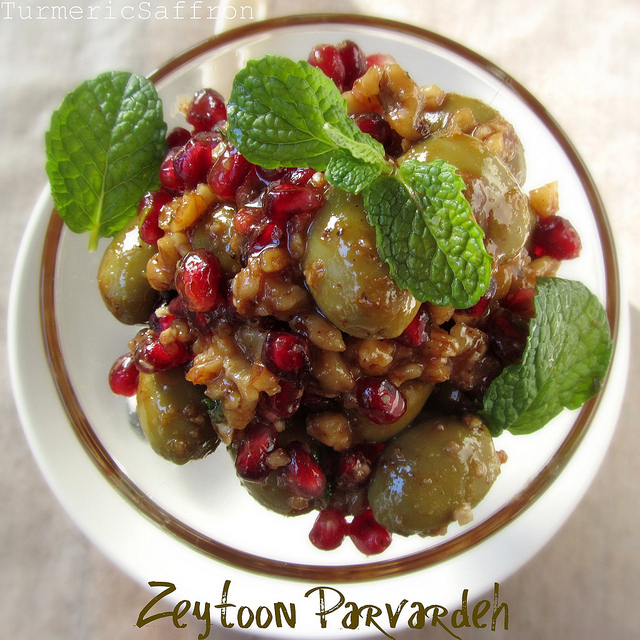 Ghanoonparvar's "Colucheh Yazdi" recipe in his Persian Cuisine cookbook. Add eggs one at a time, beating each egg for a minute before adding the next one. Add rosewater, mix well. Line two cupcake trays with cupcake liners and spoon the batter into the cupcake liners until 2/3 full. Bake for 20-25 minutes until light golden brown or when the inserted toothpick comes out clean. Remove the pans from the oven and allow to cool. 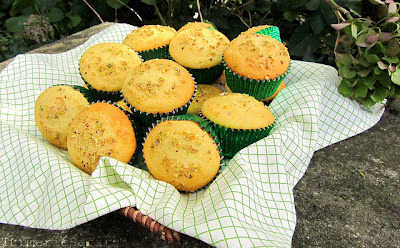 Serve these cupcakes on a tray with a freshly brewed hot cup of tea.